The ageing nuclear power plants are causing supply problems for French citizens and are helping to increase their energy bill: 50% rise in the price of electricity forecast between 2012 and 2020. The other fossil energies are no different: the price of gas will increase by 20% between 2013 and 2020. And this is not the end of it, as the French still pay 30% less than their neighbours in the European Union. At the same time, the energy context is tending towards an increase in electricity consumption. According to the International Energy Agency, it should increase by 75% between 2009 and 2030, which will automatically lead to supply problems. Faced with climate challenges, France is committed to the energy transition in order to encourage renewable energies and reduce energy consumption. The law for energy transition, promulgated in 2015, sets goals for increasing renewable energies in the energy mix. 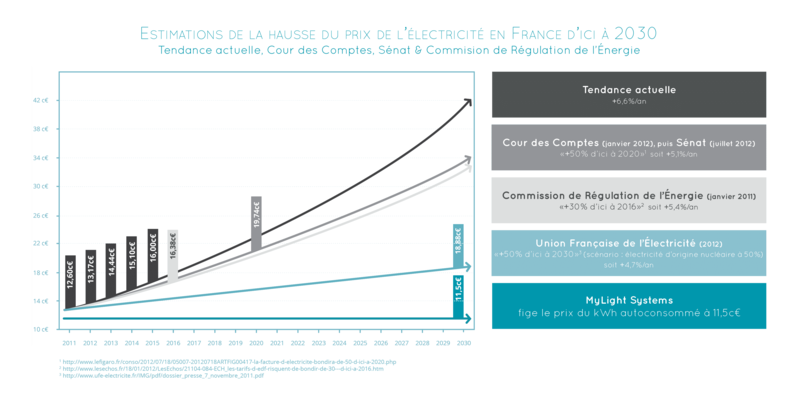 This law gave rise to the new energy transition tax credit to help French households reduce their energy bill. As a heating management solution, MyLight Systems enjoys a 30% tax credit. It has been legal to consume your own production since 2007. Renewable energies are now an essential source of electricity, especially photovoltaic. The lower material costs and rise in photovoltaic output along with the constant increase in the price of electricity have resulted in grid parity. It is now possible to produce at home cheaper electricity (photovoltaic) than the electricity bought from the grid. 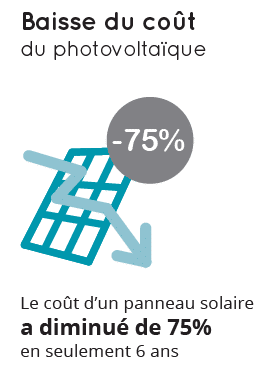 In France the price of a self-consumed kWh is €0.115/kWh on average against €0.16/kWh from the grid. The European Commission is encouraging solar self-consumption and recommends that Member States encourage self-production and self-consumption of renewable energy.